Undecided on a Dj vs Live Wedding Band? So, you’ve booked the venue. Flowers have been ordered. Your dress is hanging in a crisp, white garment bag. Your shoes, still in their box, were chosen carefully for maximum comfort.Sure, they look amazing, but you’ll be on your feet all day and night – mostly dancing! Perhaps to a DJ or live wedding band? 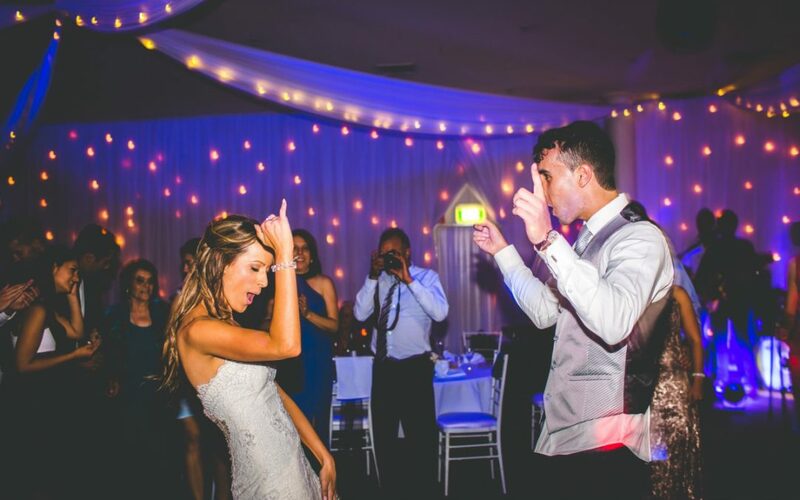 Choosing the perfect wedding entertainment in Sydney or Melbourne for you and your guests can often been perceived as a headache. Will the live wedding band play my favourite songs? Will a DJ just press play, or get the party started? Before having the live wedding bands verses DJ discussion, check out the pros and cons for each – and consider which option will ultimately provide the most enjoyable wedding entertainment for your friends and family. The DJ or live band will be providing at least four hours of music, so much of the reception’s success is riding on them! They usually have the right songs for weddings. And if they don’t have it, you can request it, and they can get it. Technology! They take up less space than a live wedding band. They generally cost less than hiring a full wedding band. Unless he’s Calvin Harris. They just kinda stand there. Improvisation is tough. With pre-programmed tracks, it’s difficult for a DJ to shift the mood in an attempt to get your drunk uncle off the dance floor. Right, so … Maybe a live wedding band is the better option? The wedding singers take cues from your guests on the dance floor. They generally play the perfect setlist and have a broad choice of songs for weddings. The wedding singers can interact, get the crowd to sing and clap along, and make them feel a part of the show. They have unique personalities. They’re less predictable than a DJ; they can improvise and dynamically change the music on the spot to suit the mood. Visually, a band looks damn cool, and a top performance from a professional live wedding band will leave a lasting impression forever. The wedding singer can introduce the wedding party as you enter the reception, and call upon them when it’s time for toasts. A full wedding band will take up more space than a DJ. Ideally, you’ll wanna see a DJ or band in action before you commit. A lot of DJs will only have still shots available, and track lists, whereas live wedding bands, like Lily Road, can provide you with videos to past performances, or live recordings to give you a feel of what they’ll bring to your big day. Ultimately, you want to get the best value for money and the best entertainment for your guests, while floating around the dance floor with your new husband to your favourite songs. After all is said and done, what are your guests going to remember? How gorgeous you looked in your gown, who hooked up with the best man, and how damn good that wedding band was and how much fun they all had on the dance floor.